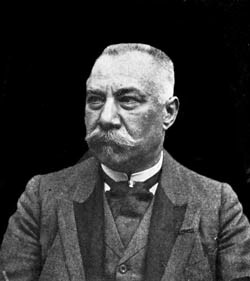 Georges Rouy was a French botanist who was among the first to identify infraspecific (i.e., below the level of species) taxa, including: subspecies, varieties, and forms. His Herbarium, kept for vascular cryptogams at the national Museum of natural history, Paris, and the rest to the herbaria of the University Claude Bernard Lyon is rich in more than 500 000 echantillons. Tome XIII: pp. 70-72: Iris, sisyrinchium; pp. 72-73: Iris xiphium, xiphioides; pp. 74-75: Iris Sibirica, graminea; pp. 75-76: Iris spuria, fœtidissima; pp. 77-79: Iris Pseudacorus, Germanica; pp. 79-80 : Iris Florentina, aphylla ; pp. 80-82: Iris lutescens, Chamæiris.